I used a box spice cake mix and baked it in an oblong casserole oven proof dish. I Crisco and floured it and also cut a piece of wax paper the size of the bottom. It keeps the flour from getting on the bottom of the cake and peels off well. I made fondant decorations. I wrapped the cake well and froze. Then I sculpted it while it was solid. I covered it with a light coat of buttercream, let dry and then I colored half of the fondant with a touch of black to make it a little gray. I covered it and I used a plastic straw and cut one of the ends to resemble a fingernail. I used that to make the scales on the fish. Use different colors of luster dust to your choice, and brush all over. Add your fondant fins and lemon, and onions, and lettuce. It is a fun cake to work on. 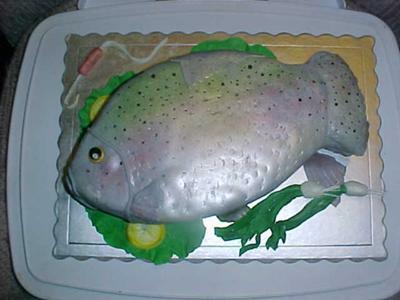 OMG Nancy, this cake is awesome; it looks so real. Can almost see it breathe! Awesome cake! It's one of those you never want to cut...just save! Hi Nancy, thanks for sharing this cake. Your fish looks so real. Awesome finishing.